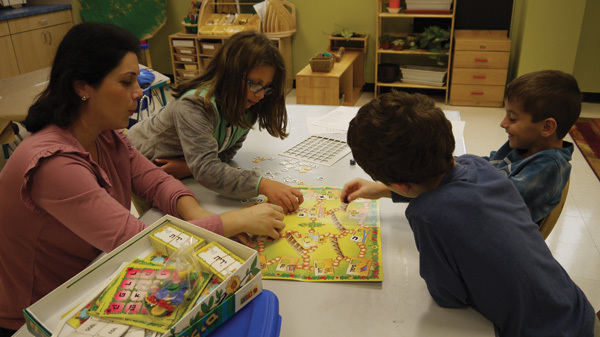 Playing board games is part of the Hebrew immersion program at Ofek. 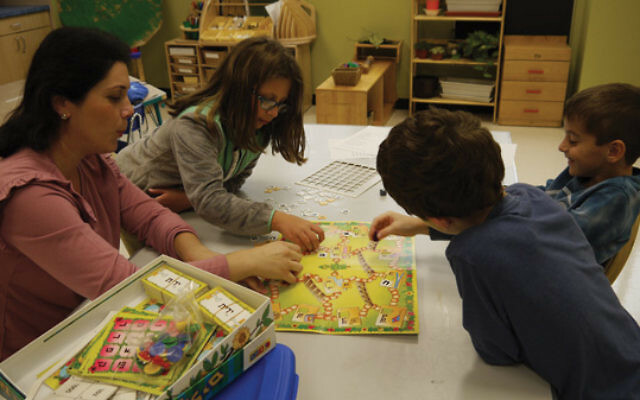 On a recent Sunday afternoon at the Cooperman JCC in West Orange, nine children, all first-, second-, and third-graders, played board games, read stories, ran races, and discussed the holiday of Sukkot. They chattered among themselves and occasionally exhibited a little too much energy. An estimated 300-400 Israeli families live in Essex and Morris counties. Elsewhere in the state, there are two defined communities of Israelis: a well-organized, tight-knit group in Tenafly and a second, looser one in Fair Lawn. Gelfand-Kaplun described the Israelis living in Essex and Morris, however, as an accidental, “not looking for an Israeli community” kind of group. According to Moshe Levi, community shaliah for the Jewish Federation of Greater MetroWest NJ, in many cases these are people who thought they would soon return to Israel but kept staying on “just another year,” which stretched into many years; in others, they are in the United States temporarily for a job and will return when the term is completed. Over the last few years, Gelfand-Kaplun, Ofek, and a host of other Israeli families have begun laying the foundation for a more organized expat Israeli community in this area. In addition to the Friends of Israel Scouts, also known as Tzofim — a prominent Israeli-American youth movement begun in 1995 with 20 chapters (the local chapter in West Orange began over 10 years ago and, with about 55 participants, is now well established but is among the smallest) — they have added holiday parties; Shishi Israeli, kabalat Shabbat gatherings that take place at local synagogues; a secular adult beit midrash; and Ofek, launched in September 2015 with 30 students. The Ofek school has received support from Levi, who has given of his own time and assigned one of the shlihim (Israelis emissaries working with the Greater MetroWest community) to teach there, and the Israeli-American Council provided a grant. Ofek rents space at the Cooperman JCC and runs two sessions there every Sunday — an early session for the older children — like the nine students mentioned above, many of whom headed off to a meeting of the Israel Scouts right from Ofek — and a later session for a younger group of 11 preschoolers and kindergartners. In its second year, the school lost nine children, due partly to families moving away — both to other parts of the United States but also back to Israel — and partly to timing. Not all Israelis recognize the need for any Jewish identity education for their kids, and many shudder at the thought of religious education in particular. For this reason they often shun synagogue religious schools, day schools, and yeshivot. Gelfand-Kaplun was among them. Originally from Be’er Sheva, she lived in Tel Aviv before coming to the states in 1998. All three of her children, now in 11th, sixth, and third grade, were born here. She explained that not only did she think she would return to Israel imminently, but she also had no sense of the disconnect the children of Israelis can feel from the larger Jewish community. Her husband is also Israeli. “It took us forever to understand that we are Israelis [but] that our kids are born to us doesn’t mean they are Israelis,” she said. Secular Israelis like her, she said, resent the reach of religion in Israel society. “So once we come here, synagogue is not what we need. We are Israelis. That’s enough,” she said, clapping her hands. Reaching that moment of realization with her eldest led Gelfand-Kaplun to join with a group of similarly situated parents to launch Ofek. The school largely stays away from religion as such and tackles instead fluency in Israeli culture. The curriculum includes holidays, geography, history, and government and structure of the State of Israel. They cover all this while speaking Hebrew. The goal is that while reinforcing the Hebrew, they are also creating community, which will be enough to sustain them. In creating Ofek, its founders researched many similar schools around the country, including three in Bergen County: Beit Sefer Nitzanim in Fair Lawn, Emek at the Kaplen JCC on the Palisades in Tenafly, and Bereisheet at Temple Emanu-El in Closter. In 2010, the JCC opened its own religious school for families with young children who were not ready to join synagogues. After area rabbis raised concerns that it was encroaching on the synagogue religious school model, it closed at the end of that year.